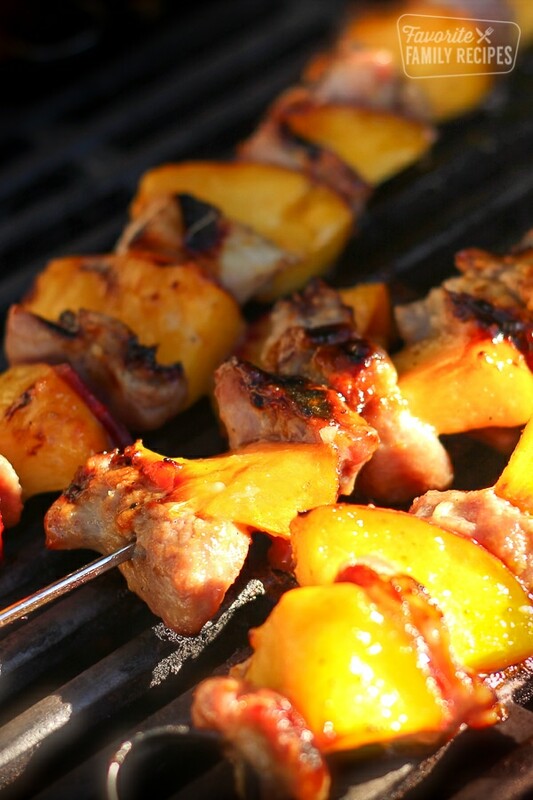 These Honey Mustard Nectarine Pork Kabobs are perfect for summer grilling! The sweet nectarines are a perfect match with the honey mustard marinated pork. These Honey-Mustard Nectarine Pork Kabobs are probably my favorite kabobs! The sweet flavor is out of this world good. The pork is tender and juicy and the marinade perfectly sweet and savory. There is just something about grilled fruit, too, that just can’t be beat. Every time we serve this to guests we get RAVE reviews. Each bite is an explosion of flavor. You just gotta try it. They will quickly become your favorite kabobs/skewers. You will be surprised how easy these are to prepare. Just make sure you oil up your grill grate so the kabobs don’t stick! Also, be sure not too cook them on too high of heat, you don’t want them for get burned. We like making these on our pellet grill so there aren’t flare-ups. Plus, it gives them an added smoky flavor that is just awesome. You can make these as an appetizer of a main dish– either way be sure you make plenty because they will go FAST! Usually we make this as a main dish and serve with either Cilantro Lime Rice or Easy Lemon Rice. I love the zesty rice flavors with the sweet flavor of the skewers. They balance out nicely. You can also serve over salad greens or with roasted potatoes. In a large bowl mix the first six ingredients and stir in the pork pieces. Marinate at least 30 minutes, longer if possible. Cut each nectarine into six wedges. Alternate the nectarine and pork onto a skewer. Place Kabobs on a grill and cook until browned. While cooking, baste the kabobs generously with honey. Enjoy! Love kabobs and skewers? Give these a try! Grilled Fruit Kabobs with Key Lime Yogurt Dip:Grilled Fruit Kabobs with Key Lime Yogurt Dip are a win at any BBQ. The grill really enhances the flavor of pineapples, bananas, strawberries, and melons. Savory Sweet Asian Glazed Pork Kabobs:You are going to love these Savory Sweet Asian Glazed Pork Kabobs! The marinade makes the pork so tender and gives it a tangy, sweet taste. Caribbean Shish Kabobs:The bacon-wrapped bananas are my FAVORITE part of these Caribbean Shish Kabobs. I know it sounds weird but they are amazing. The bacon is crispy on the outside and the bananas so soft and warm on the inside, that they melt in your mouth. Low Fat Lemon Chicken Kabobs: These low calorie zesty chicken kabobs are a great, light meal for those hot summer days. We love serving these with the lemon rice or cilantro rice mentioned above. Ems- I tried these kabobs and Jared LOVED them. Very tastey! I made these tonight and they were AWESOME. These are totally my favorite kabobs!!! They are way easy to make, too. YUMMMM! I can’t wait to make them again!